Oil Pastel Experiment – wonder how far I can push it? The word for this weeks word challenge was ‘Purple’ I thought, okay I can do this in between my other painting projects. The image shows the backsides of cosmos on a 5×7 watercolor paper 140#. Watercolor paper was used because I needed a surface that would handle a wet acrylic black and white underpainting for the background, and didn’t want to waste good pastel papers for this word challenge. Painting on watercolor paper can be a challenge with oil pastels. The paper has no tooth, so unless you use creamy OPs, like Senneliers, the surface will be unforgiving when trying to spread oil pastels and you’re almost guaranteed to have poor results. Normally you’d prepare WC paper with a grit to give it some tooth so the oil pastels have something to adhere too – making it easier to spread (like Liquitex clear gesso). I was in a hurry so I didn’t gesso the watercolor paper, well I could have predicted that outcome. The OPs clumped up and couldn’t be spread (used neopastels and mungyo OPs) even used clay shapers and fingers, but to no avail. It would have been so much easier if I had clear gessoed the surface but I didn’t, so I had to do with what I had. Not liking the finished painting, I went back into it and thought what the heck and started to experiment. Soft colored pencils were used for some edging on the petals, 98% of the painting was done using oil pastels though. This worked okay, but not likely to do this again. I don’t use solvents in my paintings, but today I tried it. To smooth out and spread the OPs on the flower petal a #1 round brush dabbed in turpenoid (a bit goes a long ways). It worked to a point, but if you go over a section too many times the turp eats through all the paint and then you have to wait for it to dry to start all over. The acrylic underpainting was perfect in texture and design for the background, I lightly smeared magenta, violet, purple and charcoal blue in various places to give a hint of color. The bottled neck vase lip was discretely painted in the lower left-hand corner. Lessons were learned today. Mainly, unless I have gessoed paper or paint with Senneliers when working on watercolor paper, I’ll go back to using my heavily gessoed boards and grit-prepared papers (Wallis and Uart) – they perform perfectly. I’m not fond of this painting, it became an experiment with a couple of lessons learned. In that respect it was time well spent, but lol it’s still going in the trash. Wondering out-loud here and would welcome some feedback: while these weekly word challenges are good practice for small pieces, I’m wondering if they have taken me too far from my primary focus – seascapes and landscapes. The challenges put me in a funk when painting them, and good or bad I show you the results. But in the end I’m not sure the benefits have outweighed the time I’ve spent away from my painting priorities . . . This entry was posted in About Oil Pastels, OPs Techniques. Bookmark the permalink. 44 Responses to Oil Pastel Experiment – wonder how far I can push it? Dear Mary, I like to explore your blog. I find treasures like these heavenly cosmos…beautiful, simply beautiful! Amazing to me that you would take the time to go so far back into my blog posts and comment, and with such a compliment. Thank you very much FGM and have a beautiful weekend. I don’t think you can get too far off track. If this is where your creative outlet is taking you…then you need to follow it….simple divine. You’re so nice Laurie! Thank you for your thoughtful comment! Hi Violet, thanks so much for your wonderful comments! Nice way to start my day. I know nothing of techniques, but I do love this gentle flower and its mild colours! Thanks Ann-Christine for your kind thoughts! You are so nice Patricia, great to hear from you. Thanks and I agree with you – appreciate your thoughts on this. I love it mary! I believe any creativity away from your main focus will always be of benefit although we won’t always see it. Thanks so much – you’re right and are reflecting my thoughts. Today is a time for new beginnings. Thank you! Thanks Marina for your encouragement and I totally agree with your thoughts. After a couple of days off, I’m ready to move on and begin creating again. Thank you! Hi Annie, thank you for your nice comments – much appreciated and happy to hear from you. You are very nice – thank you so much!! 🙂 you are very talented! Thank you Malvika, so kind of you to take the time to read and understand. Very much appreciated. I’m starting to realize that I don’t experience the same feelings about still life subjects when I’m painting them, than when I paint landscapes or seascapes. That in itself could be why I feel empty when I’ve finished with a still life – the passion is missing. Thanks ~ maybe I just discovered something here. 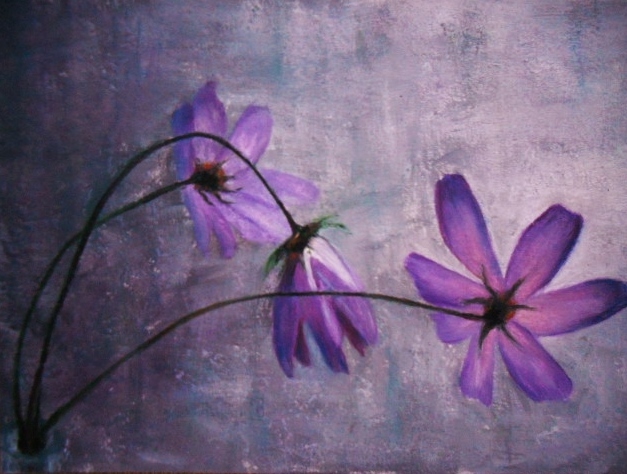 Hello Mary – of course without your explanation of your technique I would never have realised what went in to this painting here .. beautiful purple cosmos flowers .. such a nice composition and the brushed light I will call it . You have lots of different types of work going on at the moment – I love seeing the results – but can understand a little of the dilemma re the pull of your great love of painting sea and landscapes . Hi Poppy, thank you for your lovely assessment of the cosmos. It was difficult to produce a glowing soft purple and there are some other colors that I can’t seem to get a good mix with oil pastel sticks as well. So after this coming week I plan to set about doing some color analysis to see if I can replicate certain colors on a surface by blending and mixing. Perhaps a way that I can do this is to paint with a limited palette, which isn’t easy w/OPs, but I think this will further my comprehension of what the OPs can do and how far I can blend certain colors before they turn to mud. I’m working on the last painting for the competition and then my down time will be a beautiful landscape with a lake as the central subject. Now that’s relaxation and I can’t wait to build some water with my sticks. And yes, I’ll be doing some heavy gardening this weekend – my perennials have suffered in the heat and are waiting to be cleaned up a bit. It’s still in the 100 here. Have a wonderful weekend. Hi Elena, thank you for your gracious comment. I think you achieved a good result, though it was hard work, so please don’t bin it! I think the paintings that challenge us are the ones we learn most from so it’s always worthwhile experimenting. Personally I like to work with smooth surfaces as well as rough, depending on the outcome I want to achieve. And it doesnt always work out like i hoped, but many of my ‘failures’ have been the ones people like the most. Thanks for sharing your experience. Most helpful and informative. Thank you Colette, I appreciate that you took the time to comment. I agree, the painting provided some understanding in terms of surfaces that I most enjoy working with. 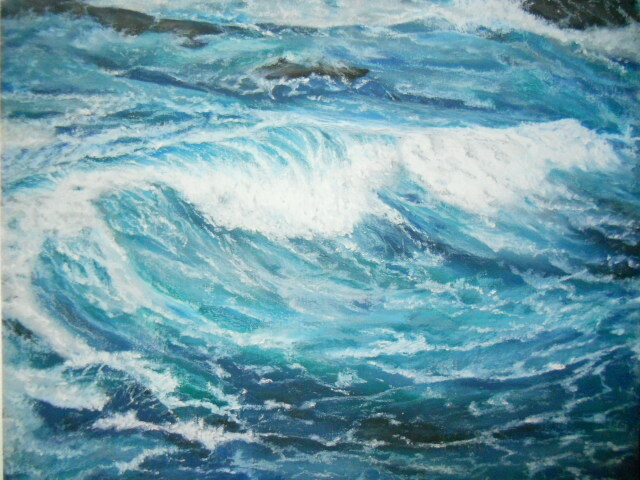 I’ve confirmed with this painting that for future pieces done on a smooth surface that Senneliers will be my go to OPs. Thanks for sharing your experiences and thoughts. Mary, surely it is not the type of feedback that you are asking for. I only want to tell you I like very much the final result. I’m pretty sure you will find positive issues in your experiment the next week. It happens… at least it happens to me and I’d like it happens to me with my most recent experiment, too! Hi Nuno, thank you and yes, I do appreciate all feedback and especially what you’ve written. It’s a new day with another opportunity to bring a canvas to life. Thank you Cindy – enjoying your encouragement! In the trash, seriously? I think this is beautiful, Mary. I understand completely, though, about how the challenges might seem to be a weight or distracting in some way. Lately it seems like everything I paint turns to mud, so I’ve just been taking a break and focusing on other arty things, doing a lot of reading and preparing to make the perfect sketch book 🙂 Anyway, I think these flowers are lovely. Hope you have a fantastic weekend! Thanks Scott. Actually trash for my paintings, is putting those that don’t make it in a pile – so at a later time I can look with a critical eye at earlier pieces and examine the elements and technical aspects. Gives me an opportunity to re-assess and decide what if anything I would have done differently. Thanks for your nice comment about the flowers ~ enjoy your weekend! I saw this in my reader and came immediately over. I hadn’t read your post yet… I loved this painting, thinking about the light you’d captured in those petals. Isn’t that interesting as in reading here, I see you are unhappy with it. I assume the light is coming from the scraping back and it does sound like 140lb paper wouldn’t work but you could use a rough 300lb or even heavier “roughs” for interesting effects(I think.. 🙂 i have tried oils on paper and ran into all kinds of trouble but don’t know much about them. I do love my sennelier gold op. but use it sparingly. Hi Linda, I needed to read some feedback and yours was perfect – thank you. I guess between this painting and my third one for the competition – well, I’m feeling like I need to re-group. So that’s what I’m doing tonight, heavy outdoor work to get my mind on other things. Will pick back up tomorrow – I may have to scrap my third painting, going to sleep on it this evening. But I do have to get back to landscapes and seascapes – they are what drives my passion. Have a wonderful weekend and thanks – it helped to read your perspective. Thanks!